You must try to prolong the mild apprehension you feel as you wait to discover what lies behind. Don't necessarily picture some abysmal darkness, some gulf or fiery furnace. Nothing like that. The important thing is to feel how the world is always liable to slippage, to disappearance, to an absence of certainty. And that you should feel this mild apprehension in front of any landscape. this weeks episode is made possible by PUGET SOUND PIZZA with a prize of BREAKFAST FOR FOUR (4)! TNT food critic once described PUGET SOUND PIZZA as the greatest retail pizza in the entire known UNIVERSE; how do you think their breakfast stacks up eh? One can only imagine... unless you win, then you don't have to imagine. EAT WITH ABANDON! by Erik on 8/21/2009 @ 12:35am Very cool. The chalkie victor can eat and take three of his or her friends to breakfast! by Erik on 8/21/2009 @ 9:56am I was raining a bit earlier this morning but now there is no rain and the pavement is drying off. 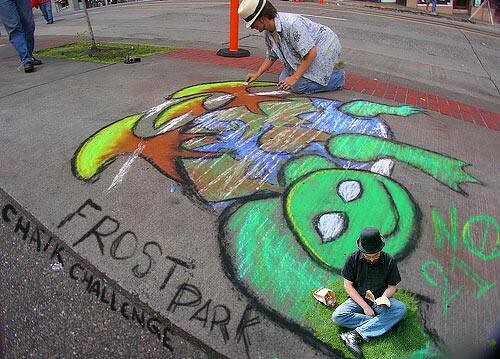 by KevinFreitas on 8/21/2009 @ 10:09am Should be a really great day for chalking! Work/life is super busy today but I'll try and swing by even if just to snap photos. Can't wait to see what everyone comes up with. Happy Friday! by ElectricElliot on 8/21/2009 @ 10:28am Sigh, don't think I can make it again. That'll be a month with no Frost Park for me. Lame. by KevinFreitas on 8/21/2009 @ 1:39pm Anxiously awaiting pics of this week's entries. Anyone? Bueller? Adam the Alien pays tribute to the other participants. I think I got shots of all of the work today. My apologies if I missed anyone. by Erik on 8/21/2009 @ 1:57pm Great to see everyone there. Anxiously awaiting pics of this week's entries. Anyone? Bueller? Hopefully, RR has some shots. by daydreamer on 8/21/2009 @ 2:03pm I vote Thorax as well! by Mandiferous on 8/21/2009 @ 2:07pm I vote for Monlux. by Erik on 8/21/2009 @ 2:09pm Great entries. Everyone needs their own inspirational action figure. by KevinFreitas on 8/21/2009 @ 2:28pm Sorry to have missed out today but thanks for posting those pics Mark! Seemed like a more simplistic, illustrative day for everyone but I was most struck by the robots with axes. I vote Mark Monlux even though he may have doctored that pic being that he was the photographer and likely didn't want shots of anyone else's to look good. @RR: Great action figure of Heather! @Heather: Welcome back to the PNW! Sorry to have missed you but hope you and Erik have a great time while your're here! by Angela Jossy on 8/21/2009 @ 2:29pm I vote Monlux. SOL INVICTUS = "Unconquered Sun". ...an ancient Roman deity and a title used by Roman Emperors after the 3rd century. Also, I vote for me! by Altered Chords on 8/21/2009 @ 3:41pm I would vote for the Heather action figure if it were a chalk drawing. I like thorax's use of latin but. I frigging vote for Arilel and her "Thunderbird"
by HeatherRebel2 on 8/21/2009 @ 4:40pm Good to see the Frost Park gang out in force today. My unconquerable soul votes for Sol Invictus! by ronbo on 8/21/2009 @ 5:04pm Those were great. 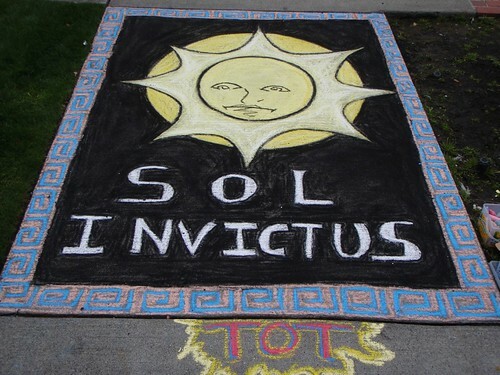 I VOTE "Sol Invictus" by Thorax O'Toole. It really struck me on a gloomy day like today. by kathy on 8/21/2009 @ 5:42pm Sol Invictus gets my vote. by demgal88 on 8/21/2009 @ 7:11pm I vote for Ariel's Thunderbird. 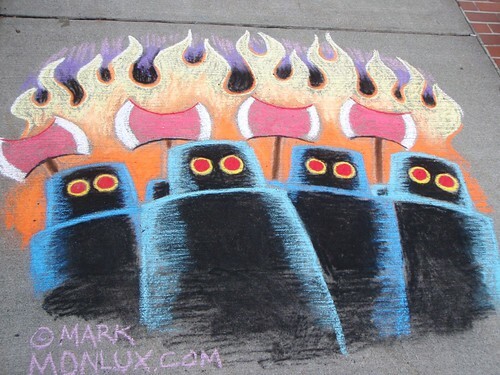 by Mark Monlux on 8/21/2009 @ 7:24pm My very real wife and I vote for robots with Axes. Because, well, they're robots. And they have axes! by jenyum on 8/21/2009 @ 7:43pm I VOTE for Monlux, because, robots. with axes. And the eyes, the eyes are just perfect. Wouldn't you like to ride in joel's beautiful chalk balloons? Vintage Shop Tools courtesy of my Grandpa RIP! Thorax doing more beatles inspired art... here comes the sun! Ariel brings the thunder bird. I have no idea what Adam is drawing but it is strange and wonderful. as always Mark engages his spectators with delightful conversation... a strategy to gain votes no doubt. by NineInchNachos on 8/21/2009 @ 8:40pm although I appreciate the skill behind the robots with axes illustration, I believe it is 'too soon' to be 'making light' of this subject matter. Robots with Axes is a very serious and very real concern. Even so, I vote for Thorax. The expression the sun is making on his/her face is pregnant with emotion. Astonishing as I had grown complacent with Thorax's renderings of 'return of stickman'; I had no idea he was capable of more elaborate conveyance of facial features. Keen sir, very keen. by ElectricElliot on 8/21/2009 @ 8:48pm I've never voted before when not seeing pieces in person, but I gotta go with Monlux on this one. Most impressive. by Joel 413 on 8/21/2009 @ 9:18pm The past few weeks have been great, while the number of participants is slightly less, the quality of work is definitely better. I hadn't intended on drawing anything this week, but the spirit moved me when I arrived. I just can't participate when I am there because the sense of community is amazing. It's so hard to decide... RR's attention to detail makes the lathe jump of the wall, Adam once again pays tribute to his fellow chalkies. And Ariel amazes with the scope and beauty of her thunderbird. Which leaves me with Mark and Thorax O'Tool... Both stunning. Both deserving. But Thorax O'Tool 's looks like a tapestry on a wall. and the robot army is coming to get me... that's just too scary. by L.S.Erhardt on 8/21/2009 @ 9:45pm Both I and my burgeoning ego thank you all for the nice compliments. I totally love the robots!!!! by LogJam on 8/21/2009 @ 10:31pm A hard decision. Many good works. I vote for Thorax. by johnsrunningbehind on 8/21/2009 @ 10:54pm Me, too...I vote the Monlux ticket. I wanna robot or two. So cool. by swampthing on 8/21/2009 @ 11:14pm VOTE Monlux, who can not like Dr. Who!!!! Robots with Axes! by tacosaladtuesday on 8/21/2009 @ 11:16pm I vote Thorax. by traciekb on 8/21/2009 @ 11:23pm My vote is for Thorax this week. Wow! That is a lot of time and symmetry around the edges. 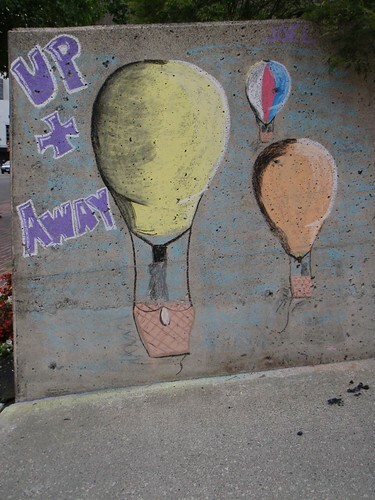 by puglizzy on 8/21/2009 @ 11:26pm I vote for the supercool Monlux chalky. Wayward robots! by Wings_of_Change on 8/21/2009 @ 11:45pm I'll vote for my Thunderbird! 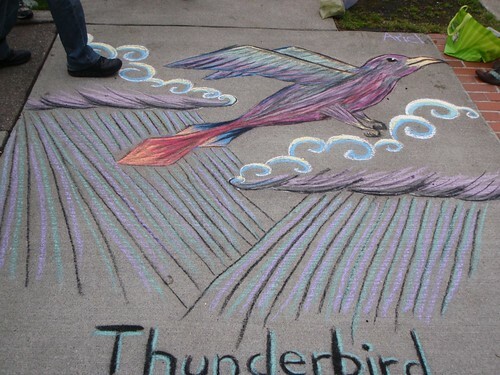 by bluegodjanus on 8/21/2009 @ 11:49pm I also vote for Ariel's thunderbird. It came out rather nice. 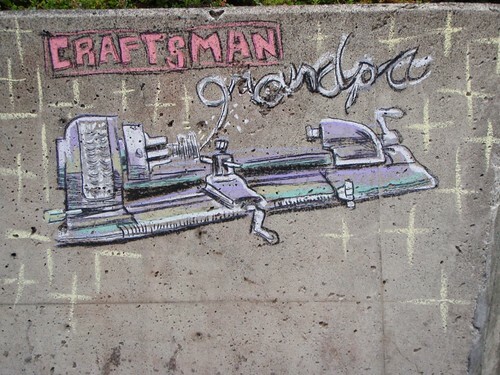 Love , Love Vintage Tools. Oh wait, this isn't a primary: MONLUX WINS! by Joel 413 on 8/22/2009 @ 12:07am AtA is too late, but his vote would have put it away for the Grand Pooba. It was neck and neck there at the end too. by Erik on 8/22/2009 @ 12:08am Congrats Mark. Also, nice counting there Joel, a mere 6 minutes after midnight. by L.S.Erhardt on 8/22/2009 @ 9:44am I thought it was one vote per avatar/person... I'm confused. by Erik on 8/22/2009 @ 10:45am Another voting controversy? by Joel 413 on 8/22/2009 @ 7:14pm Ok, I went back and recounted, writing names instead of tally marks. So, I was initially wrong. It's a TIE. Yes a TIE. not a Tagro Tie, but a TIE none the less. by Joel 413 on 8/22/2009 @ 7:17pm The only thing can surmise is that I initially counted Adam's vote, then noticed its lateness after I posted the count. So is this like a golf skin where the prize carries over to the next week? Do we have established tie rules? by Mark Monlux on 8/22/2009 @ 8:23pm Wow! Would you look at all those votes. Is that a record? by Adam the Alien on 8/22/2009 @ 10:30pm I thought it was one vote per avatar/person... I'm confused. Unless I recall incorrectly: we have, at least on several occasions in the past (though not necessarily every occasion), accepted votes from people who were not logged in, provided the person relaying their vote was an established and obvious advocate (i.e. family) of the voter. The determining factor has always been that the person who was voting-by-proxy did, in fact, have their own account (this is not always made clear, thus causing confusion, discombobulation, disorientation and kumquats). We have never "officially" legitimized nor barred this. So it's in a foggy, mushy, ill-defined area of our "rules" (if, in fact, rules can truly be ascribed to a community event without any technical leadership to define said rules :-D ). Typically, it gets sorted out between the tied chalkies without any outside intervention necessary. I would recommend that they split the prize and have a nice breakfast together at PSP. by Mark Monlux on 8/23/2009 @ 1:41pm Adam has spoken. 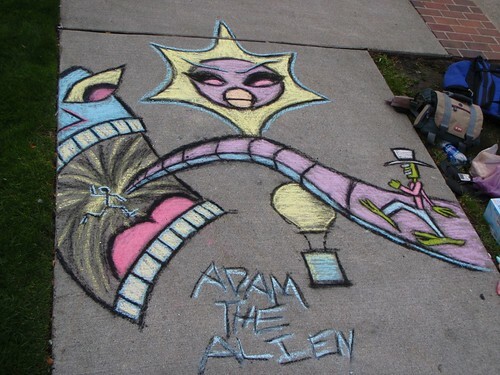 by L.S.Erhardt on 8/24/2009 @ 9:43am I'll go with what Judge Solomon, err I mean Adam the Alien says. I will happily accept a tie, and share the title & prize with the talented Mark Monlux. by The Jinxmedic on 8/24/2009 @ 3:31pm I vote "Robots with Axes". There is no other choice! by L.S.Erhardt on 8/24/2009 @ 4:04pm Ay soldier, you're too late to the battle. All that's left to do is to bury the dead.